The Gastric Bypass is a weight loss procedure that combines restriction and malabsorption to achieve significant weight loss. The procedure has been used worldwide for over 35 years and is considered a major surgical operation as it is truly a ‘bypass’ of the stomach. Performed laparoscopically, there are a few variations of the surgery performed, however all work to reduce the size of the stomach by creating a gastric pouch, which is then attached to the small intestine. By doing so, most of the stomach and small intestine (duodenum and ileum) are bypassed. How does the gastric bypass work? 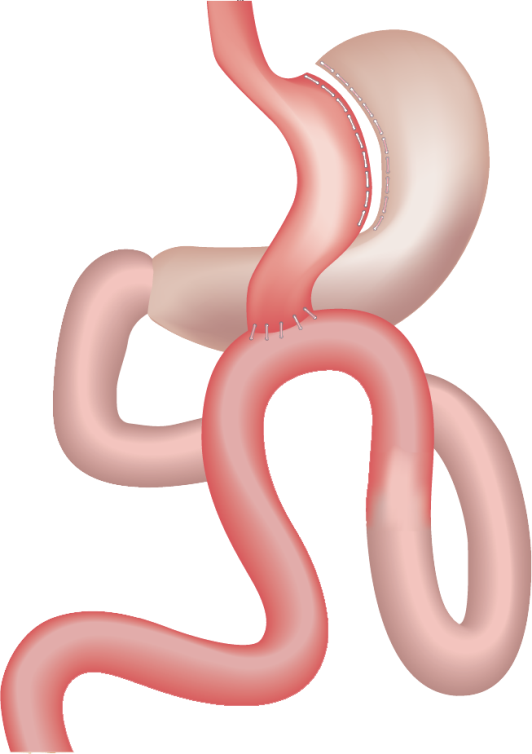 Restriction – as the size of the stomach is reduced to a small gastric pouch, patients are only able to eat a small volume of food (typically less than ½ cup). This induces early satiety (fullness). Malabsorption – As most of the small intestine is bypassed, fewer calories and nutrients are absorbed. Lifelong supplementation and adopting a healthy balanced diet is critical for maintaining good health and preventing future health complications. The gastric bypass is an extremely effective bariatric (weight loss) and metabolic surgery. Your results will be amplified and are more likely to be maintained long term when accompanied by a lifestyle program, which is why we combine the surgery with either our Silver, Gold or Platinum lifestyle program, delivered by a team of weight loss specialists, including Bariatric Physicians, Nurses, Dietitians, Exercise Physiologists and Behavioural Coaches. The operation allows the average patient to lose 60 – 80% of their excess weight in 12-18 months. At 5, 10 and 15 years the weight loss stabilises at approximately 50% of excess weight. The operation is also known to significantly improve Type 2 Diabetes, Sleep Apnoea, High Blood Pressure and High Cholesterol.